Hi, my name is Drew and I am not a Crafting Chick. I was lucky enough to meet three of the Crafting Chicks at the Evolution of Women in Social Media conference back in June. You’re probably asking yourself “What? Who let him into that conference or here on this site?” I assure you I was invited here to try out one of the great crafting projects and then to blog about it. 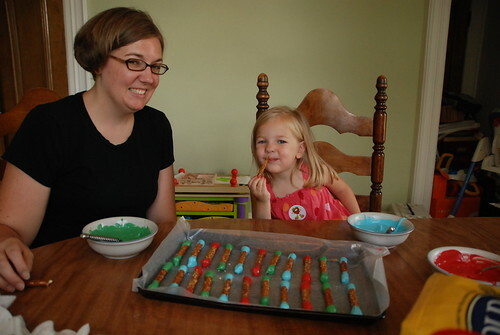 I don’t do a lot of crafting but I do a lot of photography so my post here is all about my family’s experience making edible crayons and it is mostly visual. My wife, Allison, picked up the supplies for the crafting project and I got the camera equipment ready. Allison picked up 3 different colors of candy melts, red, blue and green. I printed up some of the wrappers that we would use and then I interviewed my daughter Eva about what we were going to do. She was very excited because it combined two of her favorite things: Candy and pretzels. 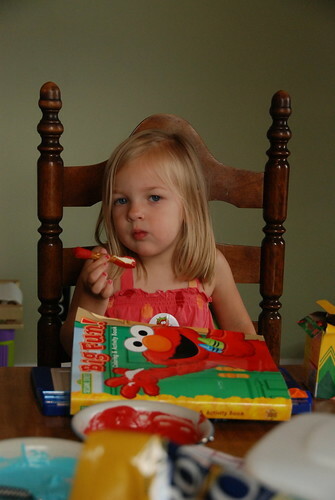 Or rather three of her favorite things, including the potential to get messy. 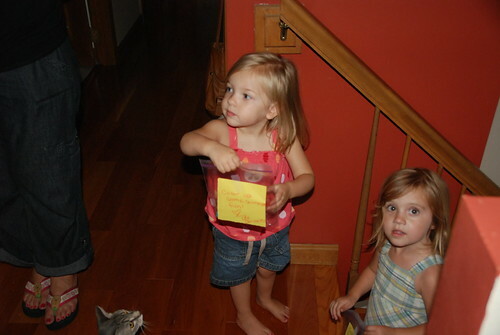 I loved doing this project with Allison and Eva because it was so easy. The chips melt quickly in the microwave and stay nice and melty the whole time we made our edible crayons. 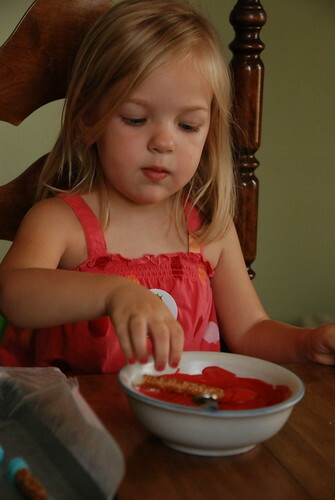 The project is also very simple in that Eva had no trouble at all because she merely had to dip her pretzels into the candy. Allison would flip the pretzel over and dip the other side (no reason tempting fate). 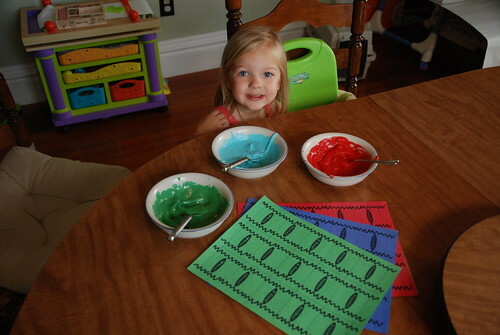 Eva enjoyed being able to choose the colors and there was no rush to dip all of one color before another so we could take our time and enjoy the craft. Finally, the finished product was very tasty. We decided that something this tasty and fun should be shared so we packaged up one of each color crayon into a small baggie, added a card and brought them to our friends. We did this immediately after we finished, too. The crayons took very little time to prep, make and complete. What took the longest was walking to our friend’s houses and then chatting with them, but isn’t that what it is all about. 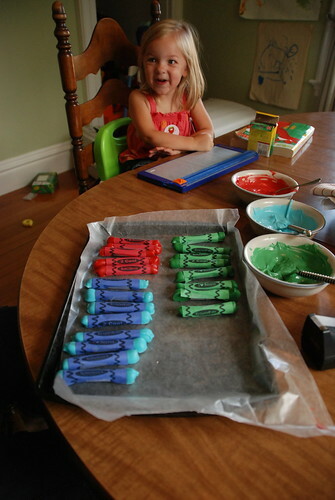 If you enjoyed these photos, check out the full Making Edible Crayons with Eva set. 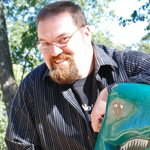 Andrew “Drew” Bennett aka “BenSpark” became a blogger in 2003. It wasn’t until 2005 that he hit upon his calling, a Photo-A-Day blog capturing his daily life in photos and blog posts. Drew has taken and posted over 1930+ consecutive photos over 5 straight years and shows no signs of stopping. After the success of BenSpark.com Drew learned that he was going to be a father, so he created Read To Me, Dad, a blog where he reviews products for kids as well as video based children’s book reviews with his daughter, Eva. While at IZEAFest ’08 moderating the Big Money Bloggers Panel Drew hit upon another part of his brand, “I’m Not A Famous Blogger” was born and became a rallying cry for a community of everyday bloggers. Drew is also a Blog and Social Media consultant and conference speaker. In addition to his own blogs also writes for the Blog World Expo blog, Dad-O-Matic, BloggingTips.com and has worked with major brands such as Sears, Philips Norelco, Philips Sonicare, Kodak and Nikon. He can also be heard as one of the co-hosts of Geek Dads Weekly. What a FUN post! I love all of the photos with your sweet family and that Eva truly had fun making these herself! My kids loved making them too last year. And I bet your friends are feeling pretty lucky to be your friends right about now. 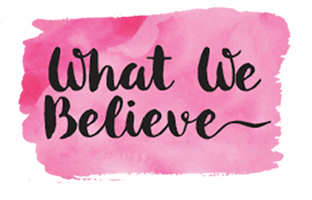 🙂 Thanks for posting here at The Crafting Chicks, we were so happy to have you as our guest! Looking forward to checking out all of your amazing sites! I was happy to be a guest poster. Love to see you pics and I love the fact that Eva enjoyed it. Thanks for stopping by our site! What a great craft idea! I love it!!! I am going to pass this one along- it looks like Eva had a blast- and Mom and Dad seemed to enjoy it too. I wouldn’t mind some sweet crayons to chew on! 🙂 Thanks for sharing! I think this would be a perfect craft for you and the family. 🙂 I bet that D. could make some Disney themed wrappers too. Great project to do with the kids. I’m sure uncle Mike loved his crayons. I’ll have to try these with the girls. So, did you make them, please share photos. That is such a great idea! Thanks for sharing. I just designed a crayon file folder game that would look awesome with those. I could make one and a bag of edible crayons for an adorable homemade gift. What kid wouldn’t love that? That sounds like a great combination of crafts. Yes, it is perfect for the little ones, very easy to do and they really feel like they are helping create something special, which they are.